← Chilled & Spicy Japanese Ramen (Hiyashi Chuka) – Fresh As It Can Be! I wanted to try out a Korean rice cake recipe that is stir-fried with slices of the main ingredient – a change from cooking rice cakes in their long cylindrical forms such as those in my previous Korean Spicy Rice Cake Tteokbokki recipe. This recipe came along just in time. 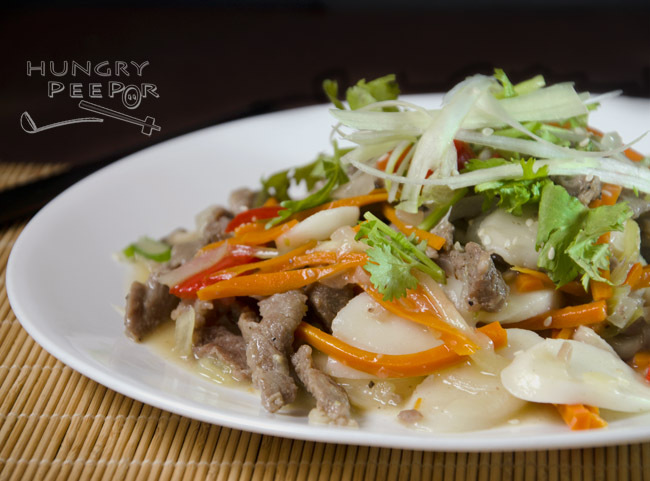 It is a sweet tasting dish stir-fried in a thick honey gravy sauce which makes the rice cake chewy and saccharine to munch on – a delightful change from the usual stir-fry of Chinese rice cake dishes that I am more familiar with. Add 6 tbsp light soy sauce, 3 tbsp honey, 2 tbsp sesame oil and 1 tsp pepper to beef. Stir in chopped green onions. Leave to marinate overnight in fridge. Soak rice cakes in cold water for 30 min. Drain and set aside. Heat oil in wok. Stir-fry beef including its marinade sauce till just cooked. Mix in mushrooms, carrots, onion, red pepper and zucchini. Cover to cook for 2 min. Stir in rice cakes, water, 6 tbsp soy sauce, 3 tbsp honey and 1 tsp pepper. Cover and simmer on low heat for another 3 – 4 min. Add 1 tbsp sesame oil. Stir quickly and remove from heat. Garnish with sliced green onions, parsley and sesame seeds to serve. 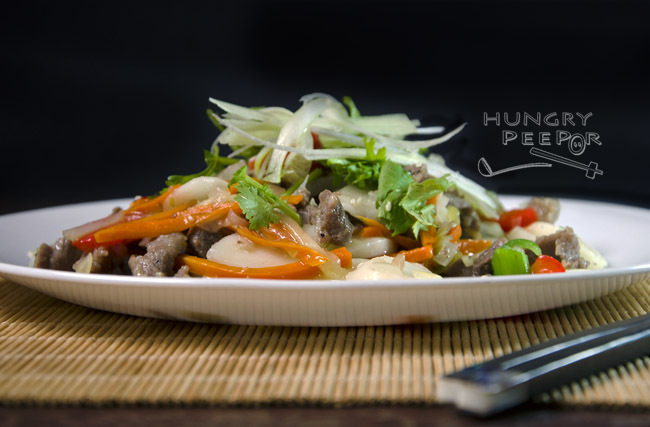 This recipe was kindly adapted from Maangchi’s ‘Korean Royal Court Stir-Fried Rice Cakes’. 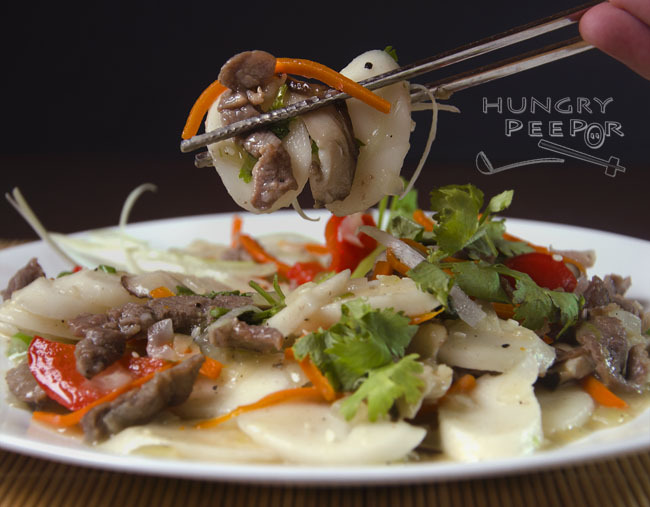 This entry was posted in Beef, Korean, Rice Cake and tagged New Year, Rice Cake, Stir-Fried, Vegetable. Bookmark the permalink.